In the cold of winter, among those contemplating a move from the frigid North to sunny, warm Southwest Florida, one vision seems almost universal: "When I get there I can grow my very own orange trees." The thought of wandering out to the backyard and picking a fresh, ripe orange prompts many newcomers to turn their yards into veritable citrus groves. And why not? Our nearly frost-free climate can produce fruit almost year round. Unfortunately, lack of knowledge can make the reality less than the dream. It can also lead to too much of a good thing. The good news is that, with a little care, your citrus can be healthy and productive. The even better news is that citrus is only one of a wide variety of fruit trees that can flourish here. With a little planning, a yard that is both attractive and filled with a wide range of tropical tastes is possible. The first citrus tree in Florida was planted around 1565, when St. Augustine was founded. Because of subsequent winter freezes, the main growing area eventually shifted southward, and the region south of Sebring now grows a wide variety of citrus, including oranges, grapefruit, tangerines, lemons, limes and kumquats. The range of varieties allows home gardeners in Southwest Florida to have citrus nearly year round. Navel oranges ripen from September to December; Hamlins from October to December; Robinson tangerines from September through October; Orlando tangelos from November to January; Mineola tangelos (the perennial favorite also known as Honeybells) from January to March; and Valencias from March through most of the summer. In addition, the Duncan grapefruit ripens from October until January, and the Marsh seedless grapefruit from December until April (although it may continue even through the summer). Citrus does well in all of Southwest Florida’s soil types: well-drained sands, poorly-drained flatwoods and limestone soil. The first needs little preparation. Proper drainage is the main concern in the second. The last may require the addition of some soil in the planting hole. The key to a good citrus crop is to start with a good tree. Buy from a reputable dealer who has a knowledge of growing citrus and can give advice on planting and care. According to Ellin Goetz, a landscape architect with J. Roland Lieber Landscape Architects in Naples, citrus trees now come with a tag from the Florida Department of Agriculture, certifying the variety and health of the tree and removing some of the risk. Spring is probably the best time of year for planting citrus, although container-grown specimens can be successfully planted just about any time of the year. While most citrus pests and diseases affect only the appearance of the tree and fruit, Henry Steiginga, tropical fruit expert at Corbin-Lindabury Garden & Nursery Center, does recommend spraying against the Asian leaf miner. Your local county extension service can provide further information on specific pests and problems. Second to citrus in newcomer popularity is easily the mango – and small wonder. The dark, shiny leaves make mangoes an attractive landscape plant, while the sweet fruit is considered by some as food fit for the gods. Perhaps the greatest delight of mangoes is the number of different varieties. Tree size ranges from dwarf to large and fruit color from yellow to red. Among the most common varieties are Carrie (ripens June to July); Keitt (August to October); Julie (June to July); Kent (July to September); Beverly (July to October); Edward (May to June); Glenn (May to June); Valencia Pride (June to July); Philippine (May to July); and Nam Doc Mai (July to August). Carrie, Kent and Philippine have the added advantage of being resistant to anthracnose, the primary fungus disease of mango leaves and fruit. Pruning and a fungicidal spray program will help protect susceptible varieties. Mangoes prefer well-drained, sandy soil and sunny conditions. They will freeze at about 30 degrees. Growing mangoes from seed is not recommended, as the quality of the fruit may be inferior. 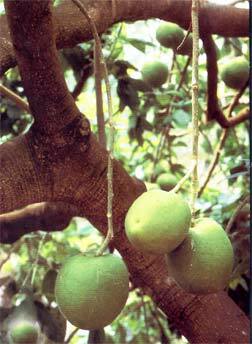 Budded or grafted mangoes (the preferred method of propagation) will begin to bear fruit within three to four years. A regular citrus fertilization program works well with young trees. Older trees need less nitrogen but adequate amounts of zinc and manganese. Nitrogen levels can affect the fruit’s flavor. So can the time of picking. Some varieties taste best when the fruit is still a little green; others need to be very ripe. Most taste best when picked somewhere in between those extremes. Those who enjoy the slightly acidic sweetness of citrus may also want to try their hand at growing pineapples. These natives of the tropics will do well in Southwest Florida if care is taken to protect them from freezing temperatures. They prefer a semi-shady spot and do best in well-drained, improved soil. The fruiting season for pineapple runs from May to September, and the first fruit can be expected 18 to 28 months after planting. The different strains start to fruit at different times of the year, although most begin to ripen in January. The Red Spanish variety fruits in May or June; Smooth Cayenne (which has almost spineless leaves) fruits from July to September; Natal Queen and Pernambuco from June to July; and Abakka from July to September. 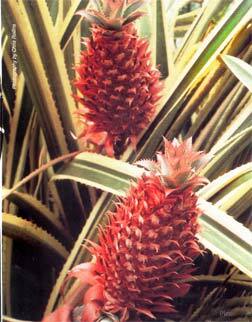 Pineapples are particularly vulnerable to nematodes, so a nematocide should be used prior to planting. The best time to plant is March, and a bulky organic matter should be placed right in the buds. Fertilization is important, and recommendations suggest one cup of a solution of water soluble fertilizer poured into the bud at least six to eight times a year and maybe as often as once a month. In addition, in April, August and December, three tablespoons of a quality mixed fertilizer containing essential elements and organics should be applied to the soil around each plant. 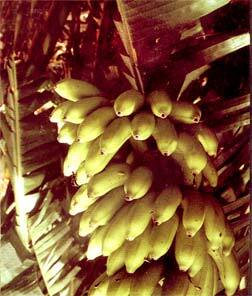 "Bananas are a big favorite here, probably because the plant itself is gorgeous," says Goetz. "In design work, they can easily be incorporated into the landscape. And all they really need is just water and fertilizer." Bananas also offer the sweet temptation of wide-ranging variety. The Complete Book of Bananas by W.O. Lessard describes 50 types that will grow well in Southwest Florida, and Steiginga has several kinds growing in his Naples yard, including the Ice Cream Banana (it tastes like vanilla ice cream, he says) and the 1,000 Finger (the fruits of which measure only a couple of inches). Dwarf varieties grow on plants that reach a maximum height of about six feet. Regular varieties can grow 10 to 15 feet tall, and Steiginga harvests some of his by climbing onto his roof. While caring for banana plants is not especially complex, they do prefer rich, moist soil and fertilization once a month during warm weather. Mulching with decay-able organic matter is also recommended. Bananas will freeze at about 28 degrees, and they are not especially salt tolerant. When planted in the sun and regularly fertilized and watered, they will grow rapidly and produce fruit after two frost-free years. The fruiting stem should be cut down and removed after the fruits have been harvested. Like mangoes, papayas offer attractive foliage and sweet, tropical fruits with a melon-like taste. Some plants may produce fruit throughout the year, but, generally, the best fruit ripens from July to October, as the hot weather tens to sweeten the fruit. Papaya plants are dioecious, which means that plants may be male or female. A solitary male plant will not produce fruit. A solitary female may, if the flowers have been pollinated by hawk moths. The newer bisexual papayas do not require male plants for fruit production. The latter are also more resistant to fruit fly infestation, a serious problem for papayas. The best way to control fruit flies is to bag the fruit with paper or plastic, shortly after the fruit has set. Because nematodes can also cause problems, it’s a good idea to treat the soil with nematocides before planting. Mulching will help as well. 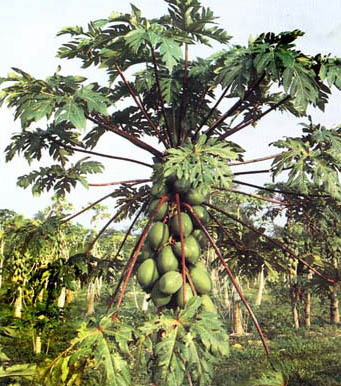 Papayas prefer sunny conditions but will tolerate poor soil. They freeze at about 31 degrees, and the young plants are especially tender. They can be grown from seed, but plants live only two to three years. Annual new plantings will help ensure continual fruit. Although sometimes more associated with California than Florida, the avocado first appeared here in 1833, nearly 40 years before showing up on the West Coast. The buttery fruit is typically used in salads or mashed for guacamole or other dips. As with mangoes, there are numerous varieties of avocado – enough to ensure fruit almost all year. The variety also allows you to find the type(s) most suited to your yard’s growing conditions. Steiginga, who is currently experimenting with growing different species in one planting hole, has a young Black Prince avocado growing with a Russell. The former produces a more typical pear-shaped fruit; the latter yields a long, gourd-like fruit. 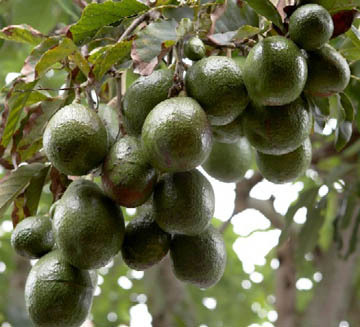 Well-drained soil is of utmost importance, as avocados will not tolerate flooding. They prefer sun and should be fertilized the same way citrus is. Spraying with neutral copper will help set blossoms and control diseases. Pollination on avocados is particularly interesting, as it puts forth blossoms that change from female to male. Those with “A” type flowers open the first morning as female (i.e. the stamens don’t shed pollen, but the pistil is receptive to pollen), close at noon and reopen the next afternoon as male (i.e. stamens shed pollen). Those with type “B” flowers open as female the first afternoon, close at night and reopen the next morning as male. The preceding represents a very brief look at just a few of the fruiting trees and plants that do well in Southwest Florida. Many can also be successfully frown in containers, a boon to condominium dwellers and others for whom outdoor space is scarce. If you want to explore all the possibilities, however, you’ll need to do some research. Fortunately, that’s not as difficult a task as it once was. More and more local nurseries are stocking a wide variety of tropical fruit trees. Their staffs are generally well informed and willing to offer advice and recommendations. More information can be gleaned from your local county extension service (listed in the “blue” pages of the phone book, under County Government), which puts out numerous helpful fact sheets on successfully growing all sorts of plants. You may want to take a ride to the Miami Fruit and Spice Park, where you can see established tropical fruit trees and attend lectures. Local chapters of the Rare Fruit Council International and such groups as the Collier Fruit Growers Council are also very helpful, and members freely share information, samples and seedlings. 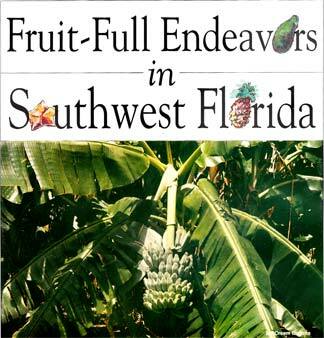 Finally, there are a number of excellent books that detail what tropical fruits will and won’t grown in southwest Florida and how best to care for them. Among the simplest but most comprehensive is Florida Fruit, published in Tampa by Lewis S. Maxwell. As Steiginga is fond of pointing out, “There’s a whole new world out there.” Exploring it can yield a cornucopia of tropical delights.